A large proportion of German climate finance supports renewable energy, as well as “forests”, in developing countries and in Central and Southern Europe. Some projects involve both elements. Finance for protecting and restoring biodiverse forest ecosystems, can and must play a vital role in reducing the severity and the impacts of climate change. However, the same is not true for industrial tree plantations. This article presents the results of a study conducted in 2018 by Biofuelwatch. It summarises the general concerns about climate finance for industrial tree plantations. And it highlights examples of German climate finance projects for such activities, and concludes with policy recommendations. Despite a detailed word search on the websites of the International Climate Initiative (IKI), GIZ, BMZ and KFW, it has not been possible to find any comprehensive data on the total amount of German climate finance that has been and is being directed to industrial tree plantations, nor has it been possible to identify all relevant projects. This is due to the vague descriptions of many of the projects, and the lack of comprehensive databases of funded projects, with the exception of those supported by the Ministry of Environment through the International Climate Initiative (IKI). Industrial tree plantations are commonly developed at the expense of biodiverse forests and grasslands as well as land used by small farmers. They are a significant cause of landgrabbing, freshwater pollution and depletion, and soil depletion. Most industrial tree plantations are monocultures of invasive alien species. They are a cause of more frequent and severe wildfires which, in recent years, have killed large numbers of people and destroyed the homes and livelihoods of many more, from Portugal to Chile, Indonesia and South Africa. Whereas forest ecosystems play a vital role in helping to regulate rainfall and sequestering carbon, industrial tree plantations disrupt natural water cycles, deplete soil carbon and store far less carbon compared to forests (carbon which is quickly emitted again if trees are logged for energy or for short-life products such as paper). Since 2010, at least 17 projects funded through German climate finance have directly supported monoculture tree plantations, including oil palm plantations. This includes projects where funding commenced before 2010 but covered a period including that year. Follow-on projects are counted as separate projects; e.g. one project might involve a feasibility study and a second, subsequent one, might involve the implementation of a strategy assessed in such a study. Two projects in India were funded with at least €1.375 million by two German ministries through the German development agency GIZ from 2009 to 2015 (see overview of the projects reviewed). The projects supported State Action Plans on Climate Change (SAPCC) in different Indian states, and the North Eastern Climate Change Adaptation Programme (NECCAP). According to researcher and journalist Souparna Lahiri, who works with the All India Forum of Forest Movements, SAPCCs and NECCAP have involved “monoculture tree plantations and centralised, top-down governance structures that have excluded rightsholders from decision-making”. All SAPCCs – developed with German government support – endorse the Green India Mission and National Afforestation Programme, and ‘afforestation and reforestation’ with industrial tree plantations is a centrepiece of both those programmes. For example, in Tamil Nadu, industrial tree plantations, including for bioenergy, are supported through Public Private Partnerships. In Rajasthan, 1.775 million hectares of forest land and 3.575 million hectares of other land are targeted for tree plantations through a programme called Harjit Rajasthan (Green Rajasthan). In West Bengal, non-native trees and short-rotation species are being promoted for the “improvement of forest trees and productivity of forests”, and in Sikkim, 10,000 hectares of land are targeted for tree plantations. According to Souparna Lahiri: “such afforestation programmes often take place on cultivated lands, village commons, and community pasture lands, where land is taken away from people who depend on it for their food security and income. Plantations reduce community access to forest produce and grazing areas for livestock. On top of this, land clearance for plantations often results in the destruction of biodiversity-rich natural forests and grasslands”. Forest movements in India had condemned the Green India Mission as a “formula for more land and resource grabbing” in a joint statement in 2010. Another concern of the SAPCC and NECCAP mechanisms co-funded by German institutions is that they encourage Joint Forest Management schemes which deny local communities any role in forest governance, and which ignore statutory Village Councils for indigenous and local communities (Gram Sabhas). This is a violation of the Forest Rights Act 2006 which recognised that forests must be managed, governed and conserved by forest dwelling communities, not by the state. Find more details on the case study here. Two interconnected projects in Paraguay funded between 2000 and 2016 supported the Ministry of Agriculture and Livestock and its Agricultural Extension Service, DEAg (see overview of the projects reviewed). One project received €6.7 million from the German government, and figures for the other project could not be found. Both projects involved ‘conservation agriculture’ for small farmers as well as ‘reforestation’ and ‘sustainable forest management’. 70% of “reforestation” consisted of exotic species, 50% of which was eucalyptus. 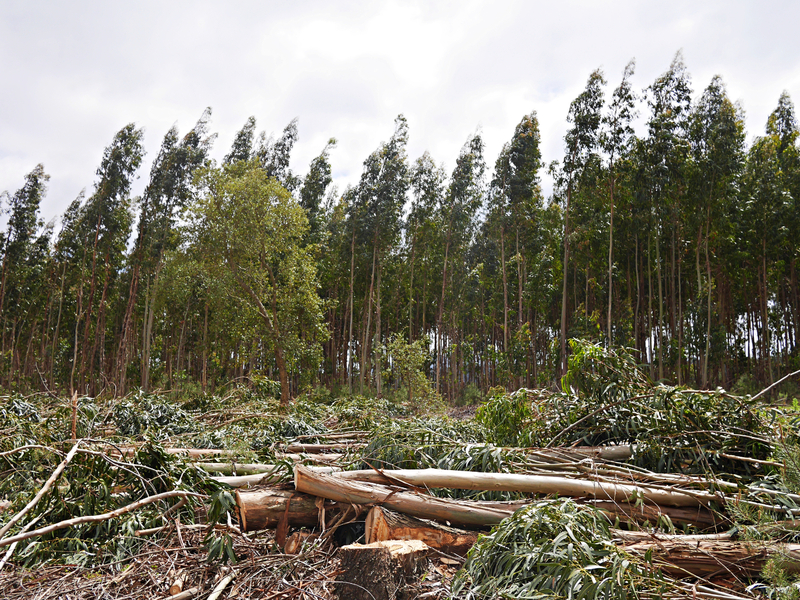 According to the lead author of a report by HEÑÓI, Centro de Estudios y Promoción de la Democracia, los Derechos Humanos, y la Sostenibilidad Socioambiental, Inés Franceschelli, demand for eucalyptus is partly driven by the genetically modified soya industry. The industry is a key cause of environmental pollution, land conflicts and rural depopulation, and is looking for cheap charcoal for drying its soybeans. Eucalyptus poses a threat to freshwater sources on farmers’ lands and neighbouring properties, which is already leading to conflicts in all departments in the eastern region of the country. It is of particular concern that the plantation-related activities developed with German climate finance became a model for a much larger new initiative, the Poverty, Reforestation, Energy and Climate Change Project (PROEZA). PROEZA was approved for funding by the Green Climate Fund (GCF) Board in February 2018, and targets 24,000 hectares of land for tree plantations. Despite concerns raised by Paraguayan non-governmental organizations (NGOs), project developers have refused to exclude eucalyptus from the scope of the PROEZA project. Find more info on the Paraguay case here. 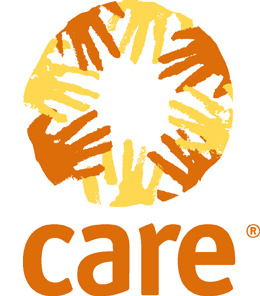 Two or three interconnected projects were funded in South Kivu, DR Congo (see overview of the projects reviewed). At least two of those projects were implemented by the Germany NGO Lernen Helfen Leben e.V. between 2013 and 2018. A third, much larger REDD+ project has been funded with €10 million by the Germany government and is scheduled to run from 2016-19, however it is not clear from published information whether or not this includes one of the two ‘reforestation’ projects by Lernen Helfen Leben e.V. in South Kivu. The larger project, implemented by the German development agency GIZ and development bank KfW, has been the focus of a complaint by Survival International in relation to human rights abuses against Batwa people in a national park, however this is not related to the plantation activities nor to Lernen Helfen Leben e.V. Diel Mochire of the land and human rights organisation PIDP, based in the neighbouring North Kivu region, is investigating allegations that reforestation activities by Lernen Helfen Leben near the town of Uvira, South Kivu – financially supported by the BMZ – failed to respect the Free Prior and Informed consent of the local population. A project in northern Madagascar has been ongoing since 2012 and is scheduled to continue until 2020, although earlier related German government activities in the region date back as far as 1996 (see overview of the project reviewed). More than €12 million of German climate finance has been made available to the government of Madagascar for a range of different activities including the promotion of efficient charcoal kilns and stoves, and to plant 7,000 hectares of mostly eucalyptus plantations for charcoal production. The official aim of the project is to reduce deforestation for charcoal. 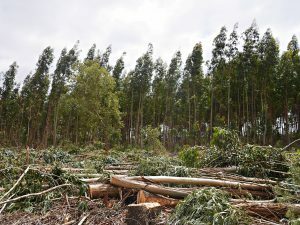 However, based on the public information available for the project, there appears to have been no independent investigation into the previous land use in the areas where eucalyptus has been planted, the impact on deforestation rates in the region, and the effects on indoor air pollution of the stoves being promoted. Most concerningly, there appears to be no evaluation of the effects of eucalyptus plantations on freshwater and on wildfires, in a country which in recent years has suffered from devastating droughts as a result of climate change. And even if the charcoal kilns and stoves are more efficient than traditional ones in the region, German government funding still helps to perpetuate household’s reliance on charcoal for cooking, rather than supporting a transition to either clean solar stoves or rural electrification. German climate finance has been supporting the expansion of monoculture tree plantations in several regions in the global South, despite the well-known negative impacts of plantations on biodiversity, forests, and freshwater, their links to wildfires, and widespread land-grabbing. In India for example, the German government has funded national strategies which violate India’s Forest Rights Act 2006 and the rights of forest dwelling communities, and which threaten to turn millions of hectares of forests and the lands of small farmers into monoculture tree plantations. Climate finance is desperately needed to help mitigate and adapt to the impacts of climate change. But it must also safeguard the rights of local communities, Indigenous Peoples, and other rights-holders affected by the projects that receive support. In addition, it must ensure that natural environments and ecosystems are not harmed in the process, and that the projects supported do not lead to a net increase in greenhouse gas emissions, as is the case when demand for biomass is increased. In order to achieve this, government ministries responsible for the oversight of climate finance should explicitly exclude industrial tree plantations from eligibility for it. Further, organisations tasked with implementing the projects that receive support have a responsibility to ensure that their projects are not harmful to local people and ecosystems. Instead, these projects should always seek the Free, Prior and Informed Consent of rights-holders, and involve them as equal partners in the planning and implementation processes. An approach that builds on the vast wealth of traditional knowledge that already exists in a place is far more likely to successfully contribute to mitigating climate change and increase resilience.